I have come to the conclusion that only having one model on the bench at any one time is counter productive. I set myself this rule some time ago but lately I have struggled to get much done even when I have only the one model to concentrate on. I put this down to far too many tempting subjects residing in my stash and my urge to get at em! So I am going to attempt two at a time, one in the construction stages and one in the painting stages. Maybe this will enthuse me and also give me a bit of variety on the bench we shall see!! The next project is the Vulcan models 1/35th scale British light tank Mk VI B. This has been whispering to me from under the bench for a while and as you know I really like small tanks and vehicles so what the hell lets give it a go. As promised over the last couple of days I have made a start on the weathering. For this model I am trying out the new AK Interactive weathering products and am using the NATO weathering set plus streaking grime. I started off with a general wash of MIG productions neutral wash then used the AK wash. This is quite thick straight out of the bottle so I thinned it down slightly with white spirit and went over the model with a fine brush in recesses and around details. The wash in the set is a very dark almost black colour which works well on the lighter parts of the tank. The filter was next and again this seems too thick to me so I thinned the first coat very heavily. The second coat went over slightly thicker and only in selected places. As you can see the filters and washes have darkened the initial paint colours down nicely. I now need to add the decals then I will start adding the streaking grime to the vertical sides of the model. Well I am now back from Portsmouth but still as busy as ever around the house. The T-90 is now ready fro weathering and I will be starting the process this evening so expect some updates over the next few days. 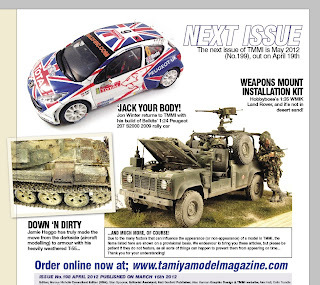 On a different note I am delighted to announce that my W.M.I.K will feature in the May edition of Tamiya model magazine. This is something I have always aspired to do and to finally be able to contribute to my favourite modelling magazine is something of a dream come true! Slightly sad I know but I don't care! I am also chuffed that the blog has now had well over 5000 unique visitors and 66 followers. So a big thank you to all my followers and visitors for your support and encouragement during some of my more tiresome builds! 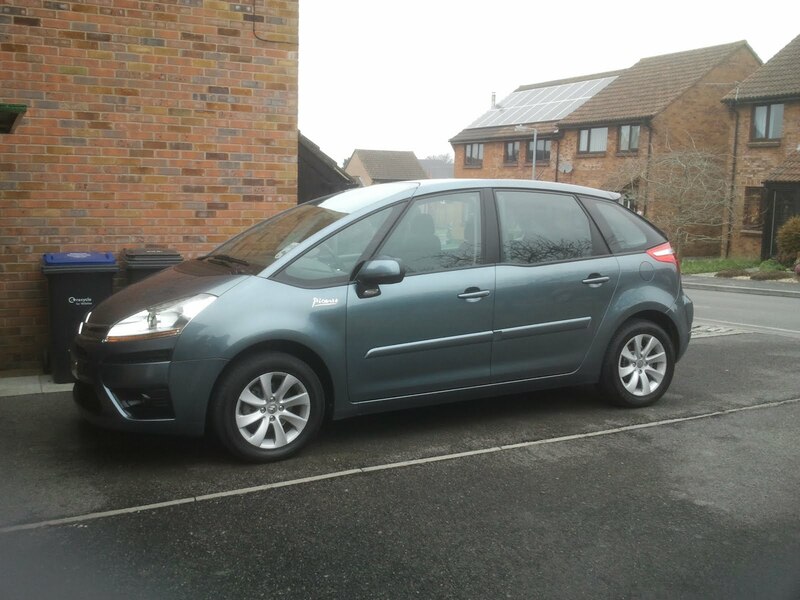 The future looks bright for the blog as I will be adding more kit reviews and also some walkarounds of interesting vehicles from my picture collection. After being totally inspired yesterday AND as an aid to a stress free me I have had a go at the T-90 today. Finished off the hard edged scheme on the turret and started on the detail painting. I am going to replace the position lights later with some tiny lenses which makes life easier than trying to paint them. All the elements are now in their final colours and just need a coat of klear before weathering commences. The F5 has however been consigned to the "lost interest" pile so may be finished in a year or two! Oh how fickle we modellers are! Since the last update life as usual has been pretty frantic in the Smudge household. First major disaster, (according to my wife and daughter) the sky plus box blows up! major problems as they cannot get their usual fix of east-enders,American x factor and all the other drivel they watch! Easily fixed thanks to ebay. Next up I had two automotive problems. The wife's car needed a new windscreen and the daughters car a new battery again relatively easy to rectify but a major pain in the wallet none the less. The good news is that I finally changed my car after looking for a suitable vehicle to transport Buck my German Shepard about as well as give me plenty of space for gear when, (ha ha!) I eventually go fishing. 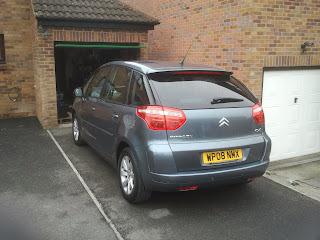 In the end I went for a rather spiffing Citroen C4 picasso and I must say so far it's bloody marvellous! Today saw me actually doing something model related! With the lads from IPMS Salisbury we attended the IPMS North Somerset annual show. It was a great day with plenty of great models to look at as well as a good selection of traders to lighten the load from our wallets. I took some models and a few books down to sell on our stand and came away with more money than I started with. Even after buying some more models for the stash. I can tell you this is an extremely rare occurrence for me! Unfortunately that will be as close as I get to actually modelling during the next week or so as I am off to Her Majesty's naval base Portsmouth for work and have to slum it in the senior rates mess for a week! just hope the beer is up to scratch!